Sometimes, couples get to that point where things aren't great anymore. And sometimes, they're down-right bad. Once a couple realizes that they have reached this point, they have to make some tough decisions. Why has our relationship taken a turn for the worse? Can I deal with the causes of our dissatisfaction? Are these problems fixable? Are we motivated to do the work? Is this relationship worth saving? Should I stay or should I go? If you've been at this place (or if you're currently living there), these questions have likely crossed your mind 1, 2, or a gazillion times. And, you've likely become overwhelmed by them. These are tough choices to make. Maybe you don't want to think about this stuff or maybe you've just become so used to the way things are that you don't want to do anything. Well, before you decide to throw in the towel, try these three ideas. Sit down and determine what's really going on. 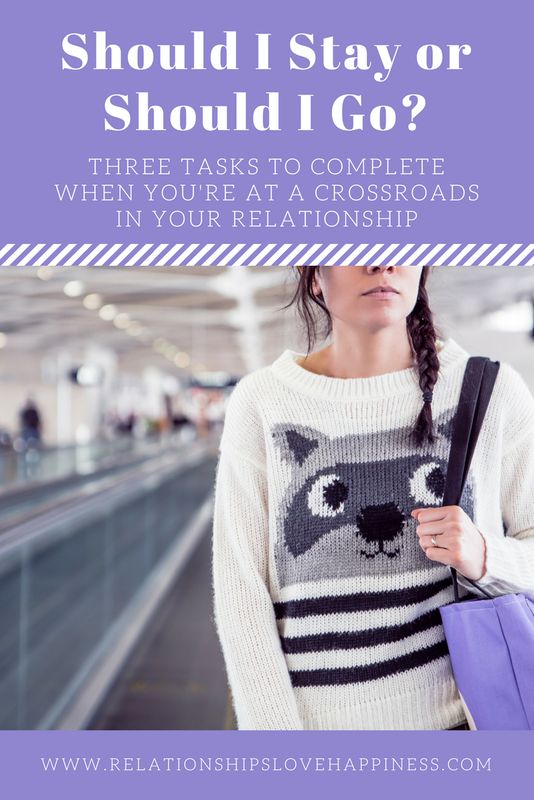 Why is your relationship status in limbo? What has your partner done? What have YOU done? Why do you think the two of you have behaved in this manner? Write these things down. Make this list include very specific things that have been bothering you about your partner and your relationship. Write about things that your mate has done in your relationship and how he or she has made YOU feel. Then take a few minutes to categorize these behaviors by answering the following sentence for each offense: "In the grand scheme of things, that was ___________________." Were the behaviors in question specific or general, significant or trivial, important or unimportant, hurtful or annoying? Lastly, figure out if you would ever be able to forgive (i.e. get over) these actions if your mate sincerely apologized for them. Make a list of reasons why you love your partner. Think about why you started dating, what he or she has done in the past to make you happy, and maybe most importantly, what he or she still does to make you happy. Why were you initially drawn to your mate? Maybe you love your partner because he or she has some admirable personality traits or because your mate does things for you or because your partner is smokin' hot; I mean, has a great smile. Whatever the reason, write it down. Sometimes, thinking about why you liked your relationship in the beginning stages can help rekindle some of those feelings and maybe help you appreciate your partner now. Create a "I would absolutely love our relationship if" list. Write down things that you would like to see change. Write down some specific "directions." Make a set of directions for your partner AND a set of directions for yourself. For example, "I would really like to hear that you love me more often," "I need to work on complimenting you," "I wish that you would put me first and actually want to hang out with me," "I want to love you unconditionally and for you to do the same for me," "I want to hold you at night and know that no one else is on your mind" are great projections for the future of your relationship. Remember that it's not just your partner who needs to change- you likely need to change as well. Just as it takes two to tango, it also takes two to fix a broken relationship. Once you have created these lists, share them with your partner. Tell him/her that you'd like to talk about some things. Set aside an hour or two to talk; with no distractions. Tell your mate that you created a few lists that you'd like to share. Tell your mate that you'd like to read the lists without any interruptions and that you'd like him/her to really listen to what you have to say. Share your lists and then talk about them together. Ask your partner how he or she would complete some of the sentences that you completed. What would be on your mate's "love list"? Also, talk about what each of you can do to fix things. And, if you think that your relationship is not fixable, calmly discuss where your relationship will go next. I can't promise you that this conversation will save your relationship, but it might at least give you an idea about where you want to go with it. You may decide to stay together or break up . In the end, it's really up to you and your partner.